We celebrate Labor Day in the U.S. to honor and appreciate the American working man and woman. Would you say it's a bit of a put down for one of America's leading retailers to run their Sunday Ad on Labor Day Savings featuring the Korean Brand LG? They did the same thing on the 4th of July. It's not that they don't carry American appliance brands. 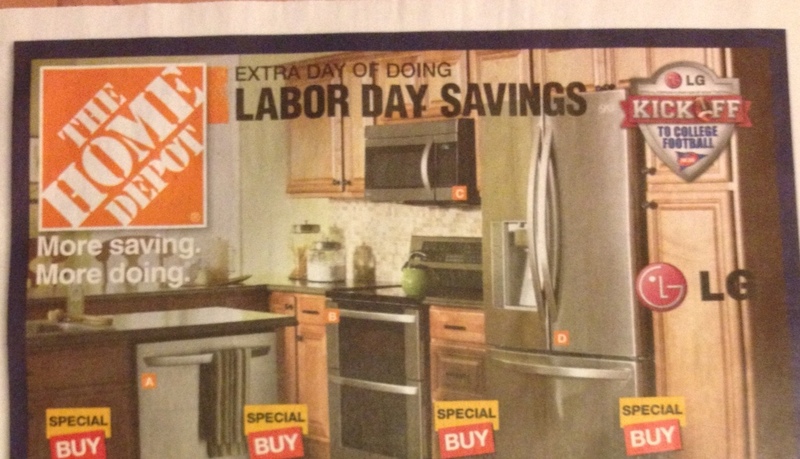 Home Depot sells both GE and Maytag appliances. GE has just opened a new factory in Louisville, KY to produce French Door Refrigerators, and of course they produce many other appliances in the U.S. Nearly all of Maytag's products are also built in the U.S. and their parent company, Whirlpool, has just opened a new LEEDS certified factory in Tennessee to build premium cooking products for their brands. I'm not knocking LG (at least not here). I just think that on a national holiday like Labor Day it's a big insult to the American working man and woman for Home Depot to feature Korean products in their ad. What do you think? This entry was posted in Appliances, Business and tagged appliances, Home Depot. Bookmark the permalink.